In order to develop nano- and microdarcy permeability unconventional reservoirs, multistage hydraulic fracturing is needed in order to make economic wells. At OFG, we believe three main scenarios may be present in the unconventional plays (both regionally and, often, within a single wellbore): a) highly fractured rock mass (lie a fault zone) where HFs cannot be created (left, below); b) formations with cemented or nonexistent discontinuities where traditional HF design can be successfully applied (right); or c) formations with weakly cemented or open/partially open natural fractures or weakness planes in which the stimulation objective is to stimulate these weak planes (center). 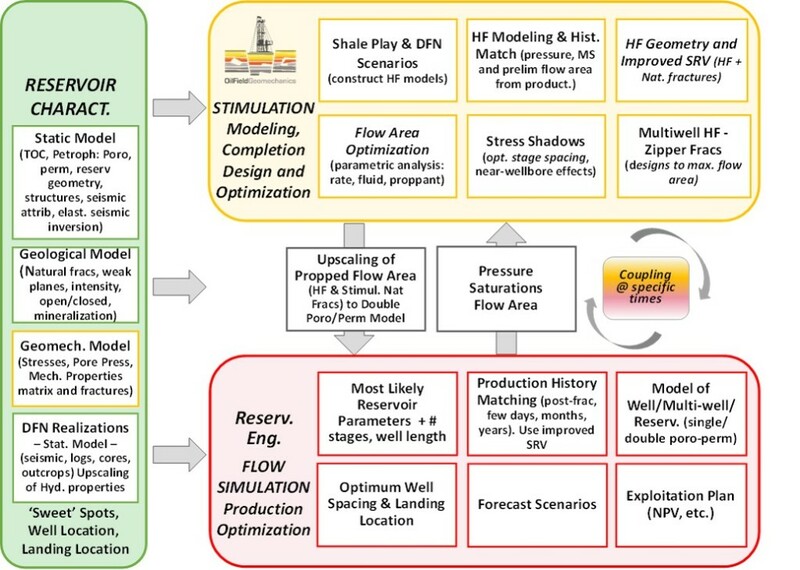 We start by understanding (via resource characterization) the particular scenario for hydraulic fracturing design – because different design strategies are needed for each case. - Influence of operational parameters and HF design on HF geometry and SRV. 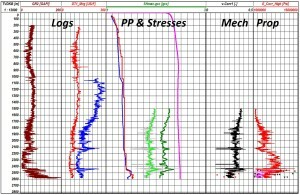 Each of these issues, other than the presence of the resource, are controlled by the geomechanical behavior of the rock mass (stresses/strains and failure) coupled with fluid flow and pressure changes. 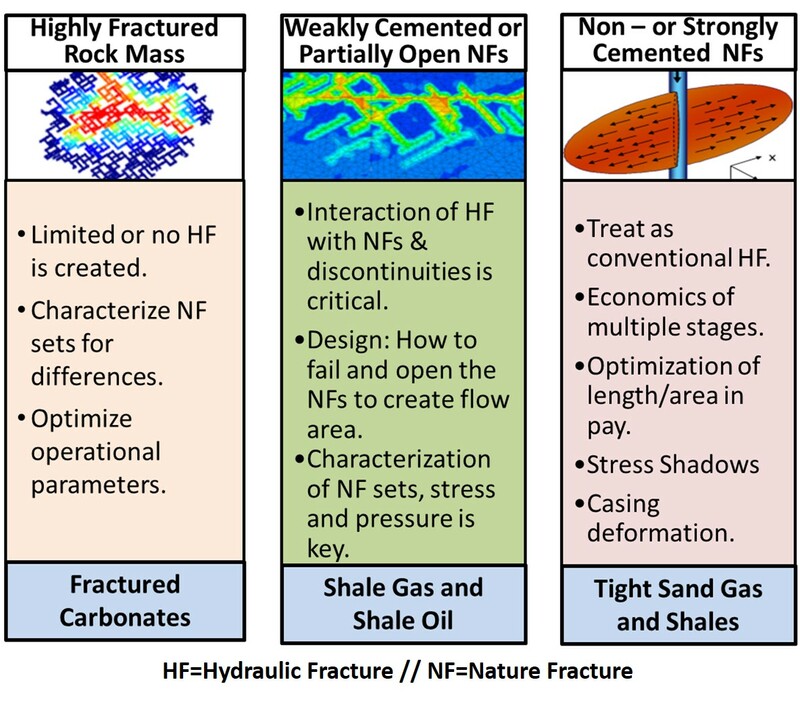 OFG uses models that incorporate the right physics for coupled geomechanics and fluid flow, including the natural fractures and weakness planes, in order to represent rock mass failure, stress capture effects, changes in the shape of HFs with multiple stages, changes in ISIP (stress shadows) and its effect on the natural fractures, microseismic behavior, casing deformations, etc. 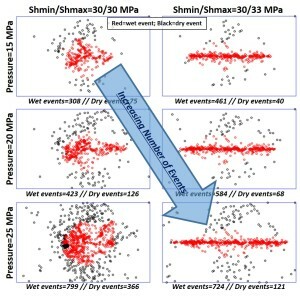 The field data (microseismicity, injection pressures, PLTs, tracers and ultimately production) together with the models help us understand and quantify the effects of geomechanical, reservoir, geological and operational parameters on stimulation efficiency (increased SRV) and optimization strategies. 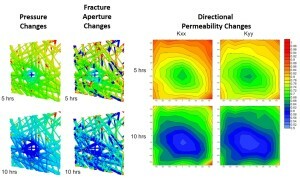 Geomechanical assessment (stress, pore pressure, and rock mechanical properties – 1D or 3D sector models). 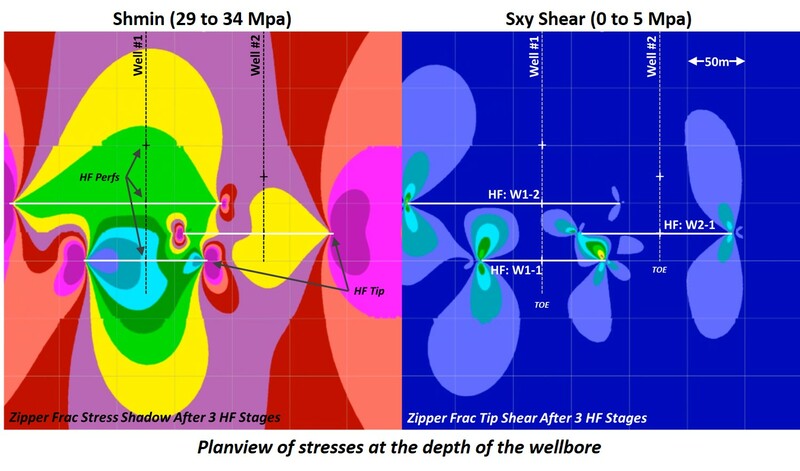 Plan view of a slice at the wellbore in a 3D HF model showing pressure development and synthetic MS events generated by the rock failure during a hydraulic fracture simulation for two different DFNs. To the left is a ‘sparse’ fracture network and on the right is a ‘dense’ network of fractures. 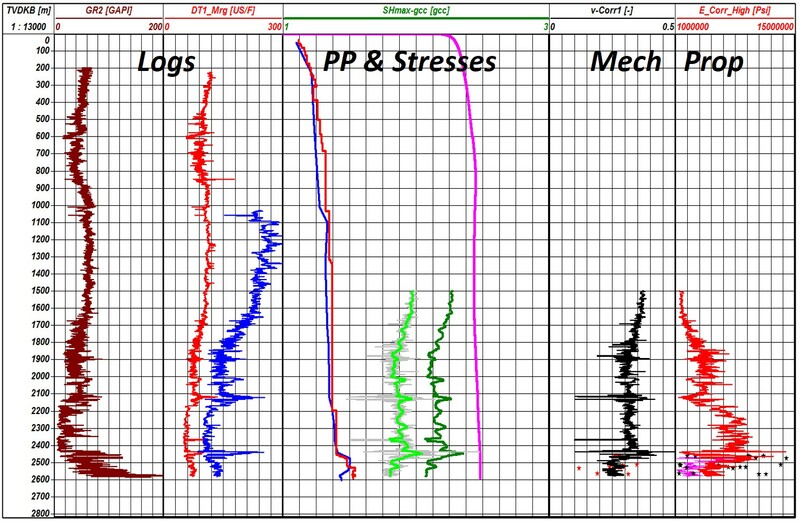 In the top figures, note the difference in pressure invasion in the natural fractures and the difference in hydraulic fracture length (the horizontal fracture from left to right). 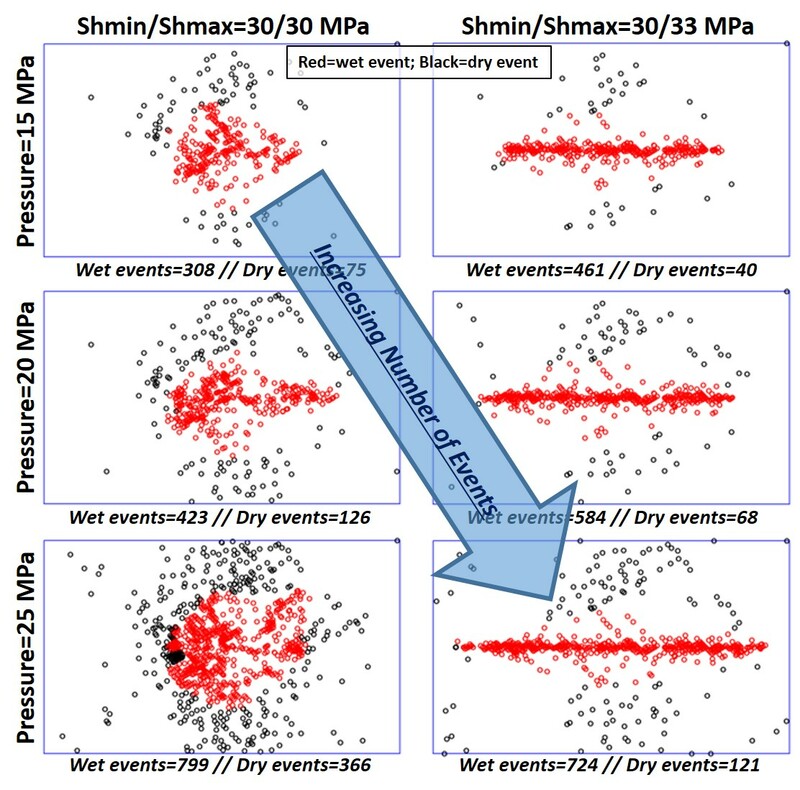 The lower figures represent the generation of synthetic microseismicity; note the difference in microseismic patterns. 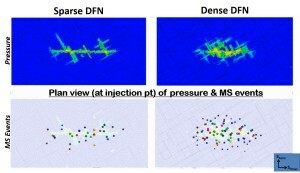 Aperture (width) distribution along the main HF plane – this is a vertical section of the sparse (left) and dense (right) DFN at the injection point. The deformation of the blocks defined by the natural fractures produce a very complicated aperture pattern in the main HF – this is not good news for proppant placement! Stress shadows occurring from three equal-volume stages pumped from two parallel horizontal wellbores in a zipper frac configuration. Left: Shmin increase distribution at the end of the third frac stage. 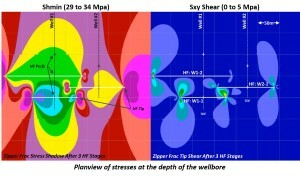 Right: horizontal shear stress distribution from the tips of the three HF stages. Note how complicated and non-symmetrical the stress patterns are. 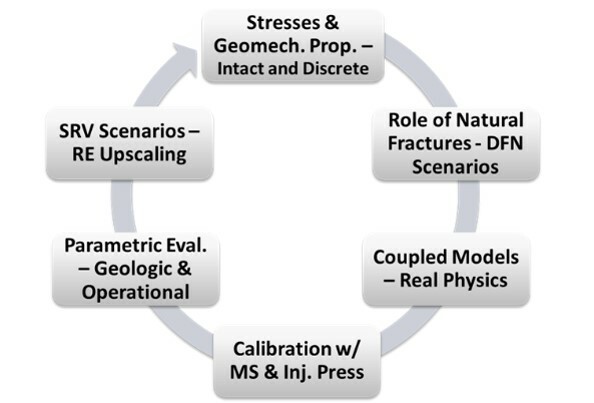 The complicated stress influence over the behavior of natural fractures needs to be accounted for in order to design optimum stage and well distances as well as correctly interpret microseismic results.